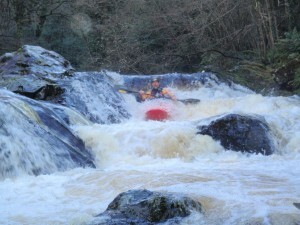 Diary of a middle aged kayaker - Feel the fear and do it anyway? I’m just back from three days boating in Devon. It was a great trip with the usual suspects, and unusually there was enough water to provide entertainment on the Upper Dart, Erme, Tavy and East Lyn rivers. After a summer of slalom and regular paddling at Lea Valley I felt strong on the whitewater, which was a nice contrast from previous years when I’ve felt a bit rusty on the first serious winter outing. Mark the ginger viking on the Erme. Let’s see how this might explain successful whitewater paddling. First off, it’s likely that anyone attracted to the sport has a personality with a preference for spending time in a spontaneous, playful state of mind. In this state people tend to seek new experiences, live ‘in the moment’, and are more willing to take risks. This contrasts with a serious state of mind in which people will plan ahead, be more risk-averse and prefer things to be calm and predictable. We all switch (or reverse) between these two states of mind, and the amount of time we spend in one or the other state is defined by our personality. Our motivation is quite different when we’re in these different states of mind, which also changes how we feel about what’s going on. So to apply this to last weekend’s paddling; I noticed myself alternating between these two states of mind on the drive down on Friday. We’d been held up by bad traffic leaving London, creating some doubt about whether we’d have time to get a trip in that afternoon. So at times I was feeling mildly worried about whether we’d make it (serious), but most of the time I was enjoying the banter with Dean, Simon and Andy, along with the chance to listen to ‘old man music’ (playful). 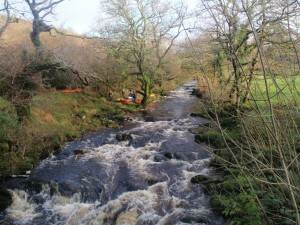 Fortunately we managed to get onto the Upper Dart at 3 pm, so we had just enough time to finish before dark. The level was fairly low, but it was still great to meet up with the rest of our group and be on a proper river again. There was a choice of two entry lines through the first drop before a sharp right hand turn into a narrow sluice. 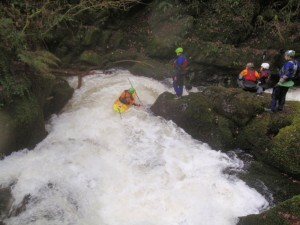 Getting into my boat to run it, I was aware of a familiar feeling of trepidation at the top of a challenging rapid. I was in the serious state of mind. Fortunately my lines were good and within seconds I was at the bottom with a big grin and feeling a nice buzz. Some chose to walk – although the slippery bank wasn’t necessarily a safe option – while John and Matty went back for more. And there was at least one roll and a swim amongst our group. Apter argues that in thrill-seeking sports like ours, we’re willing to ‘buy’ high levels of excitement through the level of fear we’re willing to tolerate. So the greater the fear at the top of the waterfall, the greater the buzz felt at the bottom. This does rely on one key factor – self-confidence. Without self-confidence we wouldn’t readily put ourselves in dangerous situations, and if we did would likely feel over-anxious and too focused on the possible consequences. Self-confidence, also known as the mastery state, means that we can use fear productively to weigh up the risks and rewards. All being well, we’re able to push our limits enough to get the right level of reward for the level of discomfort we’re willing to face. This is a highly individual process, and can fluctuate over time. When we’re ‘feeling it’ (have a strong enough mastery state) we’ll generally take more on, and get more reward. When we’re not ‘feeling it’, we’ll generally take fewer risks, and as a result may not experience such intense positive feelings on the water. When confidence drops, the experience of being in the serious state becomes unpleasant – it’s the feeling of “I’ve had enough and I just want to get off this river now”. This also explains why we can become driven to paddle tougher and tougher whitewater. As skill and self-confidence grow, we have to pay a higher price to get the same emotional reward. Some argue it’s the same neuro-chemistry that’s at work in drug addicts, who need a bigger dosage over time to get the same effect. It’s a sign of paddling maturity to step out of this cycle and decide (usually when you’re in the serious state) what your limits are at any given point in time. On our East Lyn trip it was interesting to see who did and didn’t want to make the climb to run the falls on the Hoaroak. I didn’t, largely because at that moment I was in a serious state of mind, feeling a little cold and tired, and more concerned about the rest of the day than getting an immediate buzz. As we started paddling into the rest of the gorge I warmed up and my state of mind changed again, so that I felt a good level of mastery combined with the playful state of mind to thoroughly enjoy the river. This helps in many ways; from feeling confident that the person holding the throw-bag know what to do with it, to knowing who paddles at a similar level to you so that you can watch how they manage a rapid, to knowing who tends to be over or under-confident so that you can ignore their advice. The best paddling groups are guided by mutual respect rather then being driven by individual egos. This makes them safer and more supportive of each person’s individual decisions, and helps to build a sense of collective confidence. Fatigue is a major confidence-sapper, because once you start to get tired you’re more likely to make mistakes, which in turn knocks your confidence, and so a negative spiral begins. This is increasingly important as I get older and notice that my batteries don’t last like they used to. Stay aware of how you’re thinking and feeling, particularly how you talk to yourself on the river. Anxiety is a sign that your attention is on the future rather than on the present moment. Catch negative thoughts early, and instead remember a time when you’ve paddled strongly. Bring your attention back to the task at hand, and inwards to your own breathing, posture and paddle strokes. Remind yourself that fear is natural and that it’s the price you’re willing to pay – or not. If you’re inspecting a rapid, discipline yourself to focus on your line and key strokes rather than consider every possible line and consequence. Don’t spend too long looking – it rarely helps. Well, I really enjoyed reading that. Nicely explains why we do what we do, and how it is that we (certainly I), can eliminate every thought of failure and only see success. I have always phrased this as, turning ‘bad fear’ (that which makes you freeze on the spot and makes you make mistakes as a result of worrying about what will happen to me!) into ‘good fear’ (healthy fear – that which prepares me for what might go wrong, but more importantly allows me to focus on what I need to do to achieve the successful outcome I can see). This was certainly the case in Nepal running the fall below. I can remember vividly not for single moment thinking I could not do it! Not even on the walk/climb-in to the launch spot or the run-in, which had a little 2m fall with quite a tow-back to run, did I have a single thought in my head that I couldn’t do it. I hit my line and key strokes – but I was so focused on that, and getting off the lip at the right spot and pointing in the right direction, I forgot the ‘stomp’ after becoming airborne and landed flatter than I would have liked! But interestingly once in the air and realising a flattish landing was on, I instinctively threw myself flat on the cockpit to get the nose down a bit and to not take the impact straight up the spine. look at a drop and make my mind up quickly and then go. The buzz at the bottom is greater if I picked my line, asked for safety where I think it is needed and then run it cleanly then if I watch someone else go first to get a “feel” for what will happen in different parts of the drop. 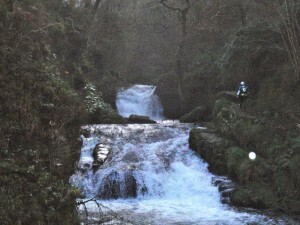 I had planned to run the top falls on the lyn on river left. But I looked too long and started doubting myself. I was stil not sure when I got in my boat. So in the end I ran the easier river right boof line as I was worried my indecision would lead to a mistake on the river left line. I am disappointed I did not run river left. I should have been looping it with matty if I realistically plan to go to cali in the spring and run the royal gorge, cheery creek etc. I think to go to cali and run those creeks well would be the pinnacle of my paddlling over the last 20 years. Rivers for me also have a lot to do with how the first hard drop goes. It I run my line and get it then I will be very confident for the rest of the river. Even if I run my line and mess it up or swim I will be confident. It is the running some and not others that is not good for getting into the “flow” of things. I also feel less part of the team if I do not run a drop and this snow balls if I continue to not run drops. For each one I do not run the more likely I will not run the next hard one. It is like getting stuck in a rut. Anyway, it was a great weekend.